KiCAD becomes better and better after the CERN commitment to support it. At FOSDEM 2015 there was interested talk about KiCAD. There were so many people wanting to be at this lecture that lot of them were standing as there was no free place to sit in the small room. Today we got even better news: now KiCAD have differential pair track routing feature and trace length matching! These features will shoot KiCAD directly in territory which was reserved for PADS, Altium etc high priced professional tools. To the best of my knowledge none of the popular amateur tools like Eagle, Designspark etc. have these features available. so, will Olimex use KiCAD sometime? Is it unstable version ? >> To the best of my knowledge none of the popular amateur tools like Eagle, Designspark etc. have these features available. I’m looking forward to future Olimex products beginning to use KiCAD instead of Eagle, especially the simpler EVBs which might encourage more folks to make their own special OSHW variants. I know it’s Olimex’s intention. A 100% open and unrestricted tool chain is the end goal for many open source supporters, and it would be one more reason to buy Olimex products and spread the good word about them. Has anyone tried converting the ESP8266-EVB Eagle source files to KiCAD? It might be a good place to start as an introduction to the new toolset, as the EVB is one of the simpler ones. Because of support and responsibility. Actually for big companies it is very important that the tool have a supplier which can also provide support and is responsible. I think they are surly companies which offer support for free tools. But I hardly think they are also offering responsibility. Offering responsability … i guess you are living in the Mickey world … No supplier even the major CAD makers could assume any warranties you mention (paying some money, giving extra support hours, developing extra customer features, etc…) but you can always keep dreaming on. 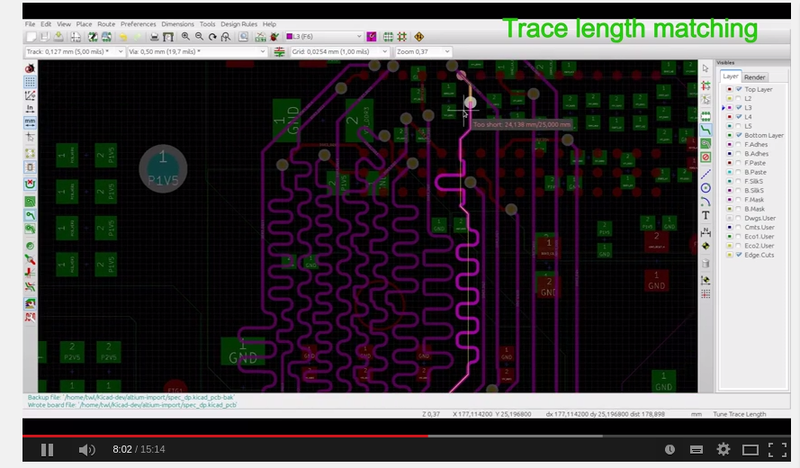 The best of tools I’ve ever used for PCB is DipTrace, it can do everything you want to. Can Trace route and can even do a 3D model. I’ve used KiCAD and Eagle too, they are good, but not as good as this. You only have to learn to work with it and than you find, that it’s very intuitive. This is only my own opinion, I don’t mind if someone doesn’t like it. In the past they got a transmission line tool to adapt impedance of the lines, to mach wave length , etc..but now I don’t know if this new tool make that calculatios?? Can any one post link to download kicad with differential pair and length matching constratins version. I have vasted more than 2GB of my data but did not got correct installer for windows with differential and length match options.